An important part of the post wedding festivities and chores is the very important thank you note. This small gesture let’s your family and friends know that you are grateful that they joined in on your special day and your thankful for their generous gifts. It is always polite to send these thank you’s out within a month of the wedding so that your guest don’t feel “unthanked” or “gypped”. 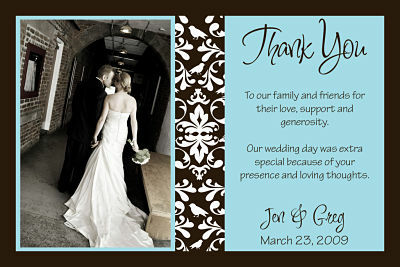 It is recommended that you use your invite list and wedding registry as the reference list for sending out thank you’s. It will make the task a lot less arduous if you are able to send your guest thank you notes as they purchase gifts off of your registry. 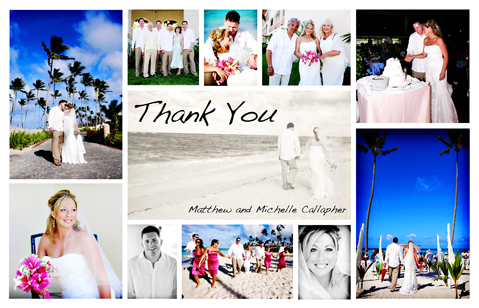 Some couples choose to go the simpler route when tackling their invites by simply placing a collage of pictures from the wedding along with a simple thank you on a postcard ( like the one pictured above). This is a very personal touch that would save the newlyweds a lot of time. Some couples choose to go a more personal route and handwrite each and every thank you. This a massive undertaking if your wedding was 50 or more people, some couples include their close friends in this process for the extra help and great handwriting. Beware, if your wedding was a large one this may not be the road for you, there are other ways to add a personal touch. For example, using personalized mailing labels or little notes on the postcard to let that person know you personally appreciate them. 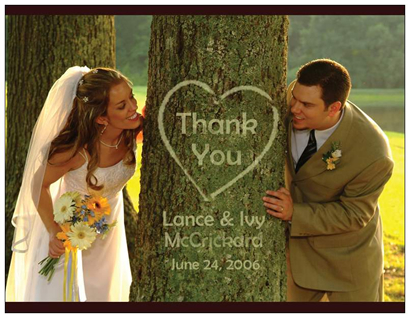 In all, though your wedding thank you notes aren’t the best part of your wedding it shouldn’t reflect in how they are executed. Even though it was your big day, your guest’s will appreciate that you took the time out to acknowledge them for joining you and supporting you. Remember, although it’s sort of a chore make sure you have fun with it. This entry was posted in Uncategorized, Wedding Advice & Tips, Wedding Details, Wedding Favors & Gifts, Wedding Style and tagged Layne Corban, Wedding Details, Wedding Invitations, Wedding Invitations & Stationary, Wedding Planning, Weddings. Bookmark the permalink.